"LeanKit is a highly flexible project management platform that lets you visualize your process, collaborate more effectively and identify opportunities for improvement. " LeanKit scored 85/100 in the Agile & Other Methods category. This is based on user satisfaction (80/100), press buzz (50/100), recent user trends (rising), and other relevant information on LeanKit gathered from around the web. 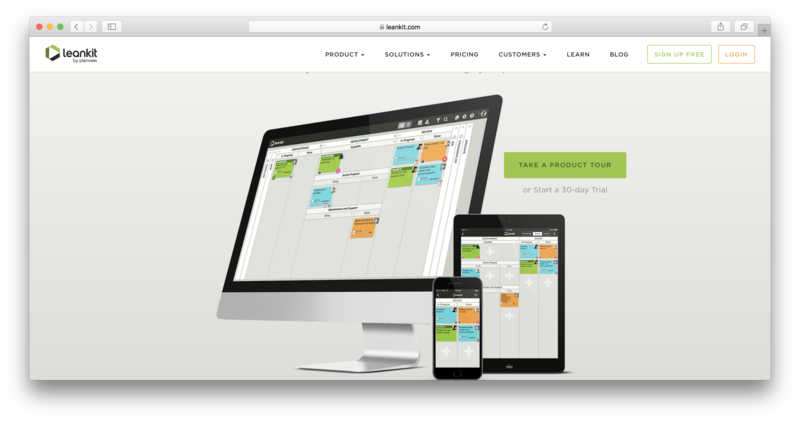 LeanKit is a web-based software-as-a-service (SaaS) visual management solution based on the Kanban system. This software solution is best suited for small- to mid-sized businesses and large enterprises across all industries. The platform allows team leaders, managers and decision makers to connect project boards at project-level as well as team-level. LeanKit provides its users with great project visibility, allowing stakeholders and decision makers to properly assess the status and progress of on-going projects as well as to effectively manage project dependencies. The platform also allows managers and department heads to get complete visualization of workflow processes and receive real-time reports and updates about project activities and the current status of various tasks and assignments. And with comprehensive reporting and analytics, which comes with different types of metrics such as quality, flow, lead time and throughput, you and your team are always be in total control of your projects from start to finish. LeanKit is a project management platform designed for businesses and organizations using the Kanban system on multiple projects, teams and location. It allows users to connect boards at the team level, project level and portfolio, allowing personnel with the right permissions and access to manage dependencies and view project status. With the features and capabilities of LeanKit, anyone with access to the software can easily and efficiently monitor team-level activities and execution, monitor subtasks and assignments for each work item and get automatically produced diagrams of various representations, including crucial data values and metrics. LeanKit project management software comes with a plethora of features worth noting. This is a cloud-based SaaS platform that is capable of more than just what a standard project management solution can do. The following are some of LeanKit’s main features. LeanKit offers fairly innovative workflow visualization. The platform provides an in-depth, consolidated look at your work and workflow, allowing you and other users to properly model and assess their own work process. LeanKit also provides great visibility of work items, blockers and potential bottlenecks in the workflow process, giving you and your team a shared understanding of project activity and status. Whether the team you’re working with is onsite or distributed across different locations, the collaboration features that come with LeanKit make the process of working with someone from across the globe a little easier and more efficient. The platform’s collaboration tools help and the rest of your team stay informed and up-to-date about the activities and status of your project, wherever you might be in the world. LeanKit connects everyone together for maximum efficiency. And this is done in real-time and across all devices, from laptop computers to smartphones. This provides users the ability to perform any assigned task in a seamless and consistent manner. LeanKit is a smart project management and collaboration platform that utilizes the data users input in cards and gather all crucial and related elements to place them under a unified metrics platform that is accessible and easy to understand. The system offer automated metrics and visual report generations of different types and matches for varying purposes. The reporting and metrics module also help users, specifically stakeholders and decision makers, to easily tag improvement opportunities in performances, share professional graphical or visual reports of a wide range of workflow elements and properly process the overall efficiency and effectiveness of your business processes and the productivity of each individual department in your organization. LeanKit project management and collaboration software offers a variety of benefits experienced by all businesses and organizations that use the product. Because of its very diverse features and far-reaching capabilities, LeanKit undoubtedly offers up a few advantages to your own organization as soon as you implement it into your system. With LeanKit, you can clearly visualize workflows and see how work goes through your team’s current process using virtual Kanban boards. The system allows you to define and adjust your processes with minimal impact to your current workflow. You can utilize vertical lanes to represent and visualize each step in your process while horizontal swim lanes signify parallel processes on the same board. You simply modify your board layout as your process changes and evolve, which helps to ensure accuracy and consistency throughout the entire workflow process. It also helps you avoid any conflicts, whether in resources, manpower or time, when it comes to delegating specific tasks. Sometimes, all it takes for a team to work together effectively is to have a single unified location where everyone can share information, files and tools regardless of where they might be. This is especially useful for teams with individual members who are working remotely. LeanKit offers integrated collaboration tools that make the communication and file-sharing process a lot easier and more efficient for teams who are collaborating remotely. With this platform, it’s much easier to stay connected with your teammates, share and gather crucial data and even ask simple questions that shouldn’t be sent in an email while you sit around waiting for a reply after an hour or two. Integrate LeanKit with your existing systems and get a combined view of your workflow, while eliminating data errors and duplicate entries. LeanKit provides an open-source integration solution which coordinates two-way communications with Oracle Primavera, GitHub, JIRA, Buildmaster, Microsoft Project Server, VS Online and TFS. And if you’re looking for integration between LeanKit and your web applications, Zapier offers a wide variety of pre-built integrations supported by LeanKit. You can easily integrate the software solution with other web apps like Salesforce, Zendesk and Google. LeanKit offers three pricing plans to suit any business size in any industry. The software and services are designed so that upgrading your plan is quick and simple. You can scale your software capabilities along with your business. Check out these pricing plans and see how they might help streamline your project management and business processes. 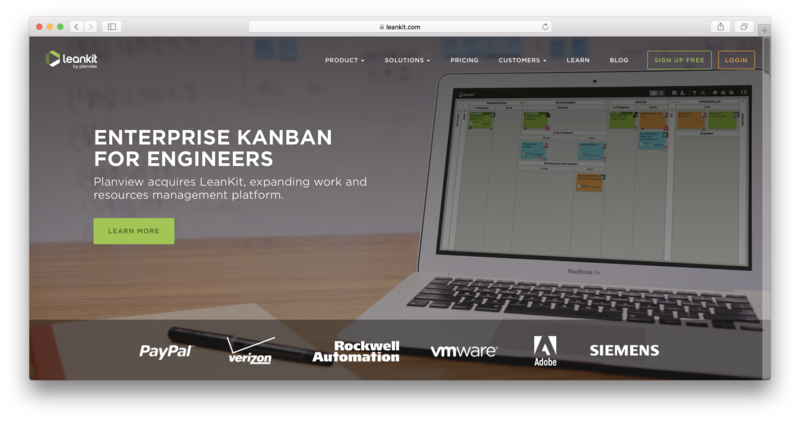 Visit the LeanKit official website for more information about their software solutions, custom pricing and other important details you want to learn. Is this software solution worth buying? The bottom line is LeanKit is a simple, easy-to-use Kanban-style project management solution with collaboration, integration and team management features that a lot of businesses and organizations find very useful. If you’re a small- or medium-sized business already familiar with the Kanban-style system when doing project management, LeanKit streamlines and improves your workflow and day-to-day processes. This product is a great and solid way to take your current solution to the next level. Who are the main user groups of LeanKit? Does LeanKit integrate with any other apps? Does LeanKit offer an API? Does LeanKit offer guides, tutorials and or customer support? Does LeanKit offer multi-user capability (e.g. teams)?